It has been a while since I posted a chocolate-centric recipe. Too long. Some might say way way too long! So long in fact, you’d think I’m lying when I profess my devotion to all things cacao. This cannot continue. What better way to right this wrong than with a decadent chocolate mousse? I love chocolate mousse. It is the king of chocolate desserts. One of my all time favourite desserts since I was a toddler. But I’ve always liked my mousse to be on the dark side and very intense. Even as a child I spurned chocolate mousse made with cream. It just tasted too, well, creamy. Not chocolately enough. Gosh I was a difficult child. Mum, shhhhh! This is one for the purists out there, including moi. 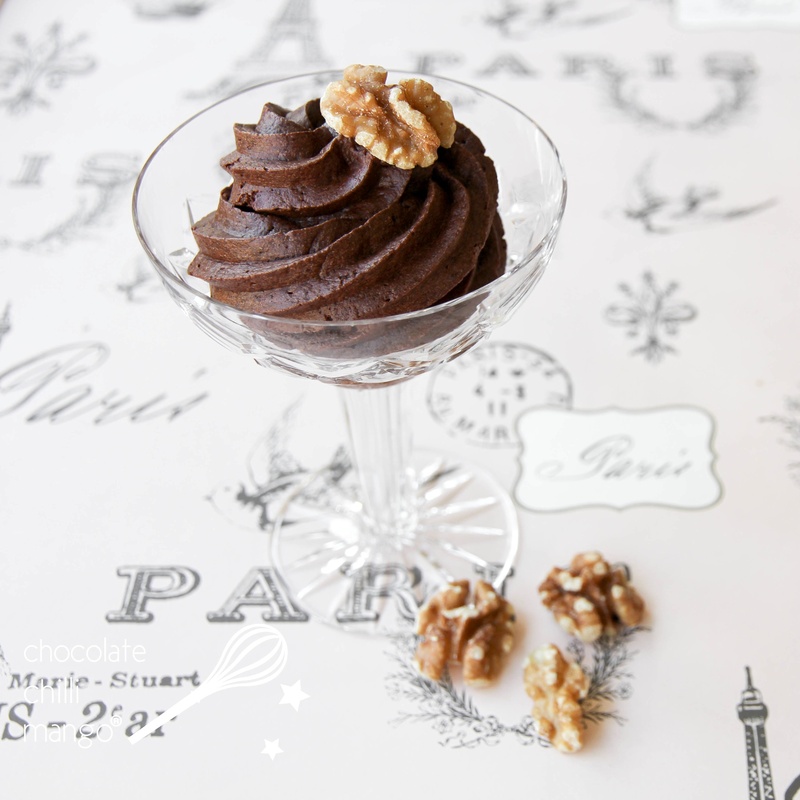 A very traditional French mousse recipe. Pure simple ingredients that allow the chocolate to shine. There is so little butter and sugar in this recipe, it’s almost a health food. Yes, decadent chocolate mousse is good for you. Well, I believe it’s true. The secret to a great mousse is air. It needs as much aeration as possible to give it that rich but incredibly light texture that melts in your mouth and makes you feel as though you’re in heaven. To get that aeration, we get as much air into both the egg whites and the egg yolks as possible, and fold the ingredients very gently to retain the maximum amount of that air. The other secret is to use the best quality chocolate you can afford. If you use bad chocolate, this is one dessert where you will taste the badness. A lot. So find a wonderful chocolate you love. I’m a Valrhona girl, so I tend to use one of their Grand Cru couvertures usually. Which one? Depends on what flavourings I might add to the mousse, if any, and whether I serve it alongside fruit, or biscuits etc. This time I chose to serve it on its own. A while ago I bought a bag of Valrhona’s Coeur de Guanaja. It’s a couverture developed specifically for use in creams, ice creams and mousses as it has a lower percentage of beurre de cacao and so doesn’t “harden up” as it sets, allowing creams to maintain a lighter texture. It’s not for the faint hearted though. Because of the lower percentage of cocoa butter, it is much more temperamental to work with and the intensity of the flavour is quite strong. It was fun to try it out here though … note the dark colour of the mousse! If not using it, I would have chosen either the Guanaja, the Araguani or the Gran Couva to make a lovely intense mousse served on its own. The liqueur is optional but Cognac, Armagnac, Frangelico and Grand Marnier are wonderful in this mousse. I added a little Cognac. You can add some vanilla instead, or a quarter to half teaspoon of spice like cassia bark or cardamom. Yes, you can even add a pinch of chilli. I love to add a little chilli, but usually only when making it for myself or like-minded souls. A half teaspoon of finely ground ancho chilli would be perfect. It has a lovely smoky flavour but not much heat and would be perfect paired with an earthy, smoky chocolate like the Guanaja. This recipe is easily doubled to serve 8 – 12 people. 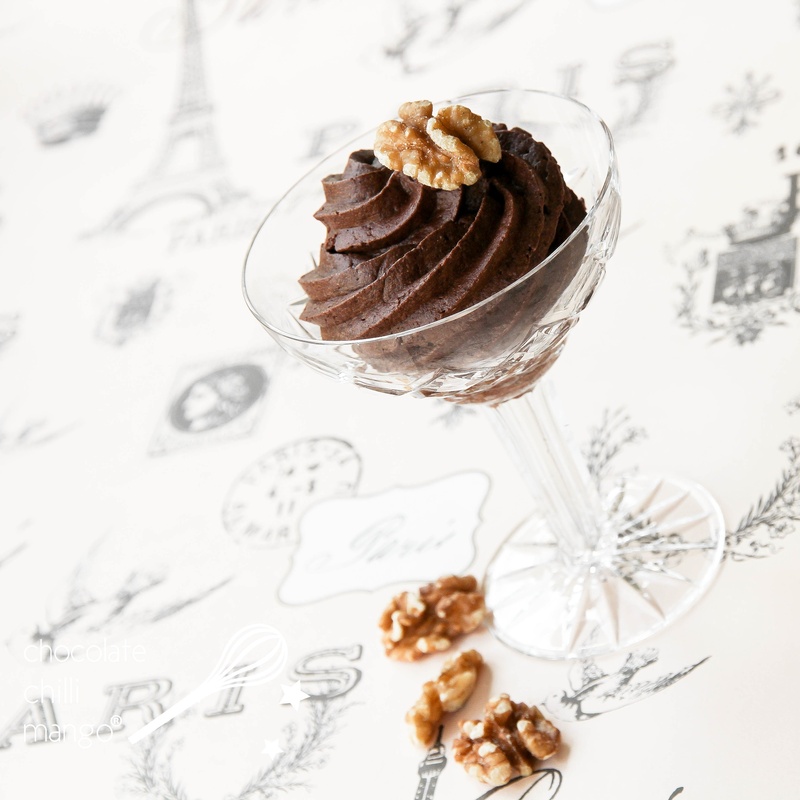 The mousse is also great to use as a filling for cakes, as a layer in entremets or as a filling for a tart. A great excuse to make it often. In a bowl, over a pan of hot water, melt the chocolate. When melted, remove from the heat, add the salt, and gently stir in the butter, cut into cubes. Stir until the butter is fully incorporated into the chocolate. Set aside to cool to lukewarm. In a bowl, over a pan of hot water, whisk the egg yolks with 20 grams of the sugar until pale and increased in volume, and ribbons when you lift the whisk. Gently drizzle the chocolate over the egg yolks and fold in, along with the liqueur. Set aside. Whisk the egg whites until foamy. Add the remaining 30 grams sugar and whisk until stiff peaks. If using a heavy-duty mixer, start on a low-speed working your way up to a high-speed. The meringue incorporates as much air as possible to give extra lightness to the mousse. Fold a small amount of the meringue into the chocolate mixture to lighten it. Gently fold in the remaining meringue, turning the bowl as you fold it, until no white streaks remain. Do this gently to avoid deflating the mixture too much. Fill some pretty glasses, ramekins or moulds with the mousse and refrigerate until set. Leave to set for at least 4 to 5 hours, or overnight. Remove from the refrigerator about 30 – 60 minutes before serving. Oh yeah, I stuck a walnut on top. Don’t know why. But walnuts and chocolate are yummy together. So there.